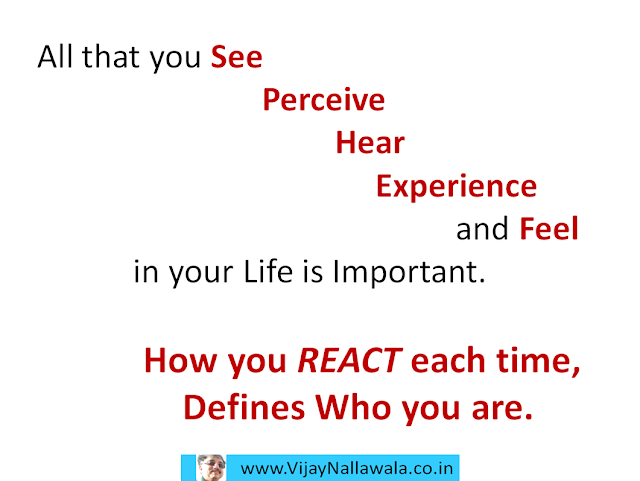 How Important are Experiences in determining the course of our Lives? Past Experiences, especially traumatic ones leave an indelible mark on one's psyche. There are, however, innumerable instances of Brave souls who have fought back after suffering huge Setbacks, both Physical and Mental. Not only have they survived, they have gone out of the way to be shining examples and inspire other stricken souls. Helen Keller is as fine an example as any. Therefore, the glaring fact is that two persons, each with different Mindsets and Attitudes would respond differently to the same set of Stimuli, Circumstances and Calamities. One might find the burden too tough to handle and buckle under the sheer weight of it, the other treat it as a Challenge and in fact come out Stronger and Wiser. Which set do YOU belong to?